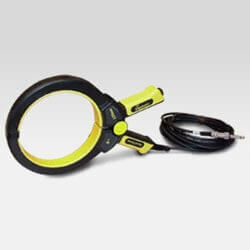 This Inductive Clamp works with the Pipehorn 800 Series Transmitters. Use the Pipehorn Signal Clamp PA570 when direct connection is not possible but you can position a clamp around an accessible target conductor. It applies a relatively stronger signal to the target conductor. The clamp can be used on conductors of 5 inches (12.5 cm) or less in diameter. A threaded fitting on the clamp handle and a remote control jaw actuator are provided for use with an extension handle (hot stick) for long reach applications. CONNECTING DIRECTLY OR CLAMPING TO ANY CONDUCTOR CAN BE HAZARDOUS AND RESULT IN ELECTRIC SHOCK, INJURY, OR DEATH. ONLY LICENSED OR AUTHORIZED PERSONS SHOULD WORK AROUND POTENTIALLY ENERGIZED CONDUCTORS. 1. Clamp around the target conductor below the electrical ground making sure the jaws on the signal clamp meet squarely and are fully closed. The better the jaws meet, the more signal will be applied to the target conductor. To insure that the Transmitter signal reaches the Receiver, the path between the point where the signal is applied and the point where it is received must be complete. If you suspect a break in this path, look for disconnected leads, circuit breakers, and open switches. It is essential to provide a good electrical insulator, such as a gas pipe at a meter, ground the conductor below the insulator. A weak signal may be due to a poorly grounded conductor. Power lines and telephone sheaths are usually grounded on both sides of the Signal Clamp. 2. Plug the Signal Clamp into the jack on the Pipehorn Transmitter to energize the transmitter and apply the signal to the target conductor. 3. With good signal output and proper positioning of the clamp, you should be able to hear the Signal Clamp emitting a shrill sound or "ringing" in addition to the transmitter's good signal tone. 4. Begin tracing the signal with the Pipehorn Receiver set to receive the low-frequency signal (press the yellow "LF" on the frequency selection switch). The clamp also works well with Pipehorn's high frequency (HF position). 1. Set up the 570 Signal Clamp around the target cable, as described above. 2. At the next vault or access point, place the Pipehorn Receiver antenna on each cable listening for the strongest signal. Note: This method will be successful only when there is no common or cross-bonding of the cables between the clamp (where signal is applied) and the receiver (where signal is detected).